Anybody remember that Euphorbia fungus I've been having trouble with since forever? 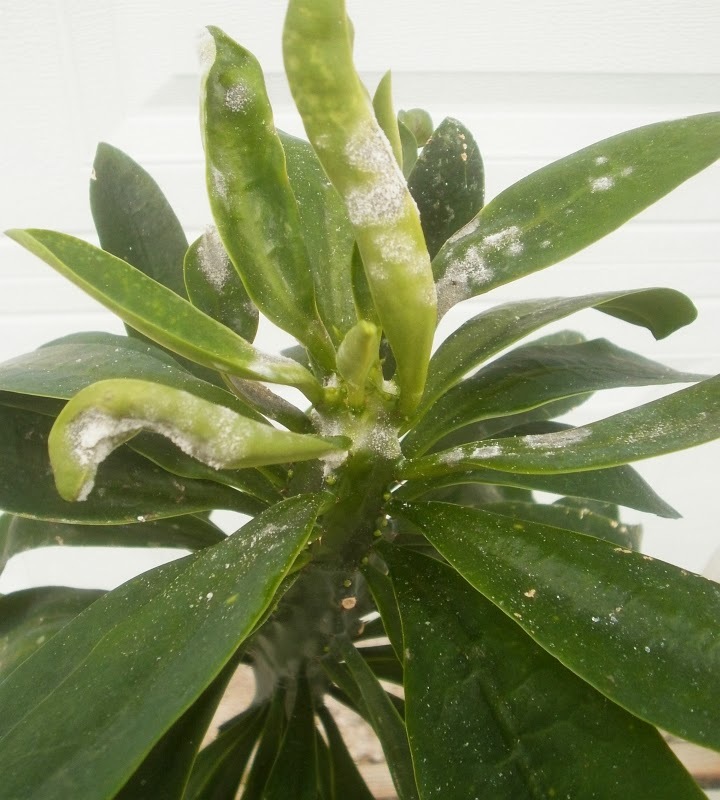 The one that makes the fuzzy white patches on Euphorbia, Pedilanthus, and Synadenium but not on anything else, and that doesn't go away after being sprayed with rubbing alcohol, peroxide, copper sulfate, or chlorothalonil? This stuff? I think I may have figured out how to get rid of it. The secret might be strong sprays of tap water. Damaged leaves stay damaged, of course, but they don't grow new patches of fungus. I hadn't tried this previously, because usually the equation is fungus + water = more fungus. In fact, I'd been taking extra care not to get water on the affected plants. The only reason I ever tried spraying the plants with water was because I'd gotten so discouraged that I gave up on ever stopping it, so I figured I may as well make it worse so I could justify throwing the plants out. Rain doesn't work, though: the fungus got worse on the plants that were outside last summer. Must be the chlorine? The only plants that washing doesn't seem to be adequate for are the Pedilanthuses. 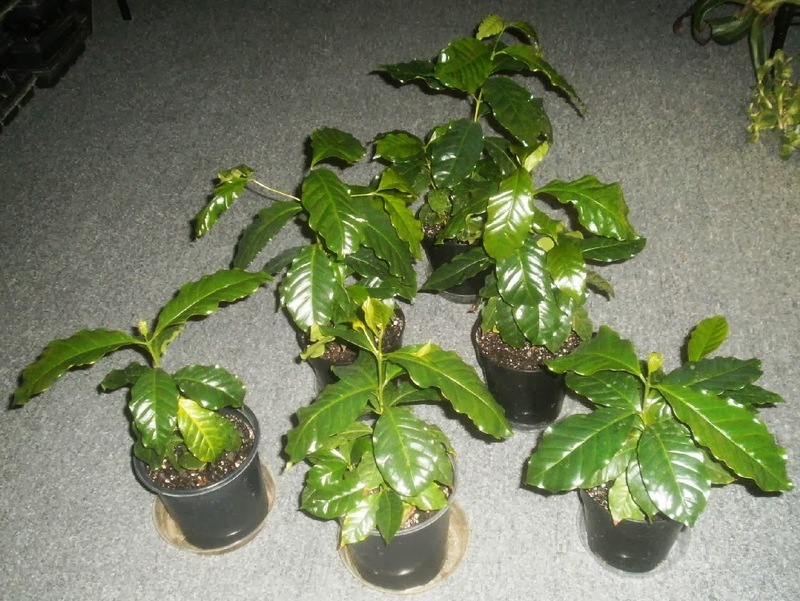 Of the three I still have (P. tithymaloides, P. 'Silver Star,' and P. 'Jurassic Park 2'), 'Jurassic Park 2' seems to be cured, 'Silver Star' might or might not be -- it's hard to tell, because there was a lot of leaf damage, and the leaf damage is the same color as the fungus itself -- and P. tithymaloides is still having problems. The Hippeastrum seedling I got three years ago from Kenneth Moore is 1) going to bloom, and 2) offsetting. I'm not sure I even knew that Hippeastrums made offsets before this; I never paid that much attention to the genus because I never thought I was going to have one. The flower won't be anything terribly exotic; it's either 'Red Lion' x self or 'Red Lion' x 'Apple Blossom.' But it'll still be my first, which is special enough. And amaryllis blooms are pretty, even when they're ordinary. So this is a thing that can happen as well. I started them on 17 September 2013. I got a clear plastic jar (formerly a Costco bulk pretzel container), put in about 2 or 3 inches of damp soil, then set the seeds on top, then added another inch of soil and sealed the top. In retrospect, I wish I had used vermiculite, because there's a raging fungus gnat problem in the container now. Washing the seeds first might have been a good idea as well, since I've had bugs come in with previous seedman.com purchases. (Only springtails, but if washing might have prevented that, then washing would have been a good idea.) But in any case. They usually take 1-2 months to germinate, but can take up to 18 months to germinate, I've heard, so this may be a long-term dirt-filled pretzel jar. 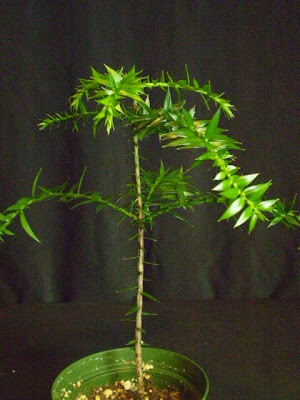 The advice I see on-line says I should move the seedling to its own pot as soon as it's large enough to be handled.3 I'm not sure how large that is, but the current plan is to give it its own pot once it starts growing some true leaves: currently it's just a short, bumpy stick. If that sounds wrong to anybody, please leave a comment. For that matter, leave a comment if it sounds right, too. That took a little less than two months to sprout. For this one, I used soil instead of vermiculite, and I didn't soak it in water for 24 hours after harvest, so I hadn't been sure it would do anything. But it seems the pre-drying soak is optional, and it doesn't matter tremendously what you try to germinate them in. For the moment, it's just this one pot, the six seedlings from last year's batch, and the parent plant (which is doing terribly and I don't know why4) but I started a pretzel container full of vermiculite and seeds5 on January 15, and have two more batches of seeds to sow (95 seeds next week, and 205 seeds in early March), so this is just a harbinger of the coming Coffea stampede. 1 $5.95 plus shipping. That was the same order as the Strelitzia junceas (5 seeds for $2.95; previously), and I also got seeds of Calathea lutea (10/$3.95). 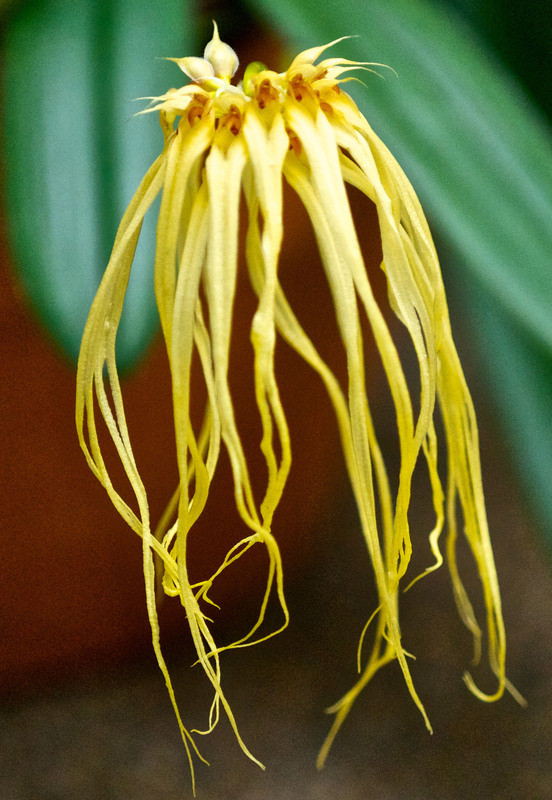 Both Strelitzia and Calathea are supposed to be irregular germinators, but it may be time to give up on the Calatheas: they take a lot of space that could be going to Anthurium seedlings, and so far none of the ten have done anything. I can be pretty patient when it comes to waiting for plants to do things, so I'm not planning to throw them out immediately, but . . . well, they should start thinking about germinating, if they know what's good for them. Best guess: the plant is now between 7 1/2 and 8 1/2 years old. 4 My best guesses: cold (it's in the plant room, on the floor, and the plant room floor has been very chilly, several times, because of the periodic blasts of cold this winter), dry (it dries out a lot faster than it used to, and probably needs a larger pot), and maybe hot, dry air (the only place big enough to put it is also pretty close to the plant room heater). There's a second plant in the pot, maybe half the size of the big one, and it seems to be doing fine, though, so none of the explanations completely make sense. 5 And I do mean full: 149 seeds. The pretzel jars aren't huge -- about 8-10 inches / 20-25 cm in diameter? -- so the seeds are packed in there pretty tightly. I did not ask for a new bug. And if I had, I would have been asking for a new bug to replace the scale, not a new bug to add to the scale, much like Huey Lewis wanted a new drug to replace the problematic drugs he had previously tried, not because he wanted more variety in his drug use.1 And yet. The problem is that I don't actually know what new bug I have, nor how to make it go away. So I'm asking y'all for thoughts. It looks basically like household dust. In fact, it looks so much like household dust that I've been assuming for quite a while that that's what it was. The overall orange/red tint to the photo is because of the light source I was using, and is not the actual leaf color. 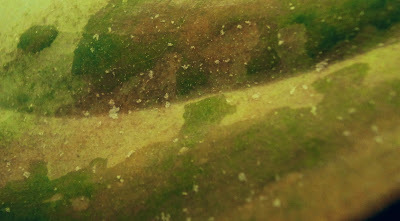 The dust hypothesis didn't actually make that much sense, because it was only ever on certain specific leaves, and was sometimes accompanied by weird brown-orange discoloration at the leaf margins. When I tried to find an unaffected leaf for comparison purposes, I noticed that all the leaves seem to be doing this to some degree or another, but I think the picture above gives the general idea. They all eventually wind up looking like the leaf on the left, but are supposed to look more like the leaf on the right. I don't know why the margins would be discolored, though, as the bugs seem pretty evenly distributed across the whole upper surface of the leaves. There were also frequently sticky droplets of something or another. 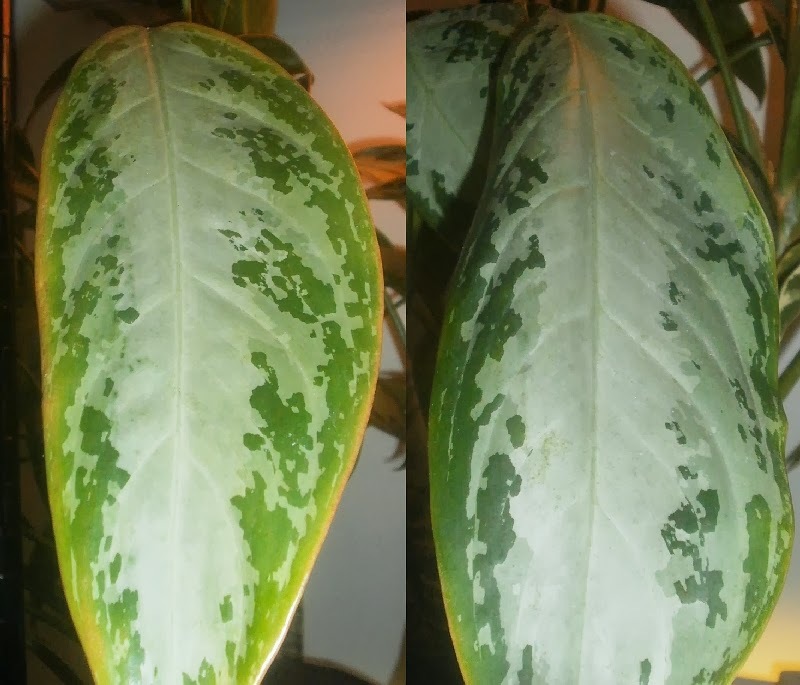 The droplets didn't alarm me terribly, because a lot of my Aglaonema varieties produce sticky droplets on the outside of the spathes when they produce flowers, and I first noticed the "dust" as the first affected plant was flowering. I'm still not 100% convinced that the droplets are related to the bugs, actually. So why do I think there's even a problem? Because I checked the leaves out with the microscope. As usual, getting decent photos with the microscope is nearly impossible, so forgive the quality, but you can see a couple mite-like things in the center of this photo, a relatively in-focus third one just above and barely to the right of those, and pieces of blurrier ones here and there around the periphery of the photo. Which, it looks like an arthropod, not an insect: blurry though the picture is, it's pretty clear that they're holding four legs in front of the body, and either one or two pairs behind it. Plus there's that overall tick-/ mite-shape going on. Obviously there are many, many species of mite, but the only ones I know of that make a habit of attacking houseplants are the two-spotted spider mite and the cyclamen mite, and I don't think these are either of those two species. 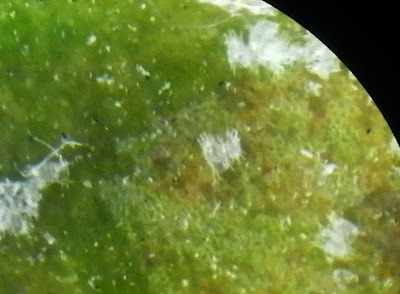 Under the microscope, spider mites are 1) much larger, 2) yellowish and opaque, instead of translucent white, 3) inclined to stay mostly on the underside of leaves (these mites are almost 100% on the upper leaf surface), 4) detectable by the visible webbing they create, and 5) will move while you're looking at them under the microscope. I've never directly observed cyclamen mites under the microscope, but the pictures that come up in Google are of rounder, smoother creatures with stubbier legs. Cyclamen mites mostly look like white jellybeans, as far as I can tell, which these do not. It's conceivable that I'm actually seeing the dead skins left after the mites molted.3 That's happened before, with the deep-sea crab/skeleton/spider/ghost things (probably actually aphids) I talk about at the end of this post, and would explain the translucent whiteness and lack of movement. I am also willing to entertain the possibility that my Aglaonemas are being haunted by the ghosts of deceased spider mites, because that likewise explains the translucent whiteness and makes about as much sense as anything else. Of course I've Googled. There's plenty out there about spider mites and Aglaonemas, but nothing about any other kinds of mite. So what about it? Anybody seen anything like this before? Have any suggestions for what I could do to find out what I've got, or how to make them go away? Suggestions for dealing with spider mite ghosts are especially welcome, since Google is as silent on the topic as you'd expect. 1 Side note: it's a little peculiar that he's asking for "one that makes me feel like I feel when I'm with you." 'Cause, you know, if you've got that in drug form, then you don't actually need the girl anymore, right? I mean, wouldn't it make more sense to just spend a lot of time with her, since she already exists and makes him feel exactly like he feels when he's with her, rather than asking the world's chemists to go to the trouble of inventing a whole new drug with these super-specific effects? I think about these things. Maybe Huey Lewis should too. 2 Almost all of it has been on 'Emerald Bay,' which is in my office. Also affected: 'Golden Bay,' 'Diamond Bay,' and 'Brilliant,' all of which are in the living room. 'Gold Dust,' which sits right next to 'Emerald Bay,' and has been for quite a while, doesn't seem to have the problem at all, though. Pretty (?) picture: "Cirro. Lion King"
I don't know what this one actually is. "Cirro." 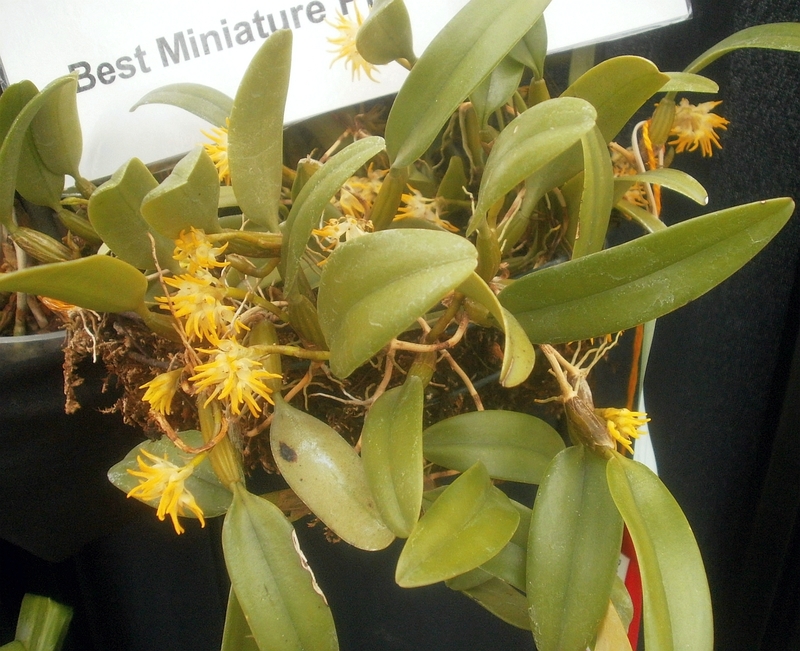 doesn't appear to be a standard orchid genus abbreviation, so that's not helpful. There does exist a Cirrhopetalum Lion King, which under normal circumstances you'd think that obviously that's the plant, but that plant's flowers don't look much like this one's flowers. 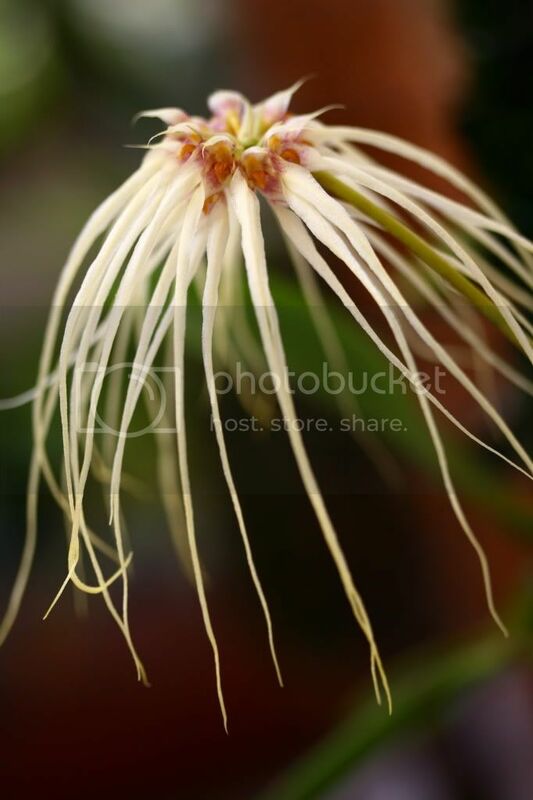 There's also a Bulbophyllum Lion King, which might be the same thing as the Cirrhopetalum Lion King, as the petals are similarly long and weird (picture), the genus Cirrhopetalum was apparently recently separated from Bulbophyllum, and orchid categorization is such a mess that I've come to think of the names as little more than random stabs in the dark anyway. But the fact still remains that the flowers on this plant are only vaguely like those on Cirrhopetalum Lion King, so even if that's the intended ID, I'm not sure it's right. But then again, using Google image search to try to make this determination is probably also a mistake, as Google image search is frequently also not much better than random stabs in the dark. So I dunno. Open to guesses from readers on this one.